We help you to tell your story, whether it’s in a speech, a feature article, or a newsletter. A Passion for Parkas tells the story of how Dani Reiss transformed a solid but static family business into one of Canada’s fastest growing companies, Canada Goose. A young serial entrepreneur serves up some good advice, features an interview with Ryan Smolkin, the founder of the famed Smoke’s Poutinerie. Game Theory tells the story of the entrepreneurial drive behind the St. Catherines, ON rising digital media star, PixelNAUTS. The Ontario Government’s Summer Company provides funding, advice, and mentorship to help young entrepreneurs start their own summer businesses. 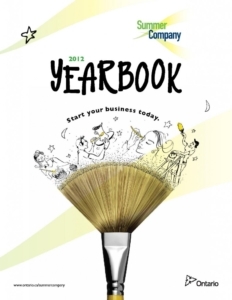 The Summer CompanyYearbook tells the stories of the ventures launched by young entrepreneurs.